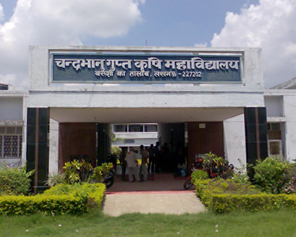 Chandra Bhanu Gupta Krishi Mahavidyala is the only college in Lucknow and Bareilly commissionaries which has become not only the excellence of agricultural education but also the center for the development of farmers as several training programs and exhibitions are arranged by this college in their interest. It is the result of hard work and close supervision of its esteemed manager Shri Bhagwati Singh ji that at present about 1500 students are studying in this college and mostly passed out students are working in government/non government organisations. The foundation stone of his college was laid by then Chief Minister Shri Mulayam Singh Yadav on 10th February, 1995 and now this college is one of the renowned agricultural degree college of in state. The college is equipped with all modern technologies, facilities like agricultural research farm, dairying, chemistry lab, computer lab, internet, library, hostel, canteen and mess etc. Presently B.Sc. Ag. (Hons) and M.Sc. (Ag. )classes are held and efforts are under way to allied employment oriented courses. The result of this college is almost 100% and it has acquired the distinction of being agriculture faculty in CSJM University. Our students have made the college proud of them. Their achievements are reflected in the overall results in the State University examinations.